With an attendance of 16,000, the sixth Royal Rumble did not coin a tagline like the others. The card featured four matches on the undercard, with the Rumble as the main event. The Steiners defeated The Beverely Brothers to open the show. Shawn Michaels defended the Intercontinental Championship against Marty Jannetty; which was worth a watch. Bigelow put an end to Boss Man in a forgettable singles. The WWF Champion Bret Hart, retained his title against Razor Ramon via submission. For the first time in history, the Royal Rumble promised the reward of #1 contender to the winner; and they would go on to Wrestlemania to challenge for the WWF World Heavyweight Championship. As Bret Hart left the event as champion, the winner of Rumble #6 would meet him in the main event of Wrestlemania. And for the last time calling a Royal Rumble event (technically Gorilla was around for ’94, but did commentary over WWF radio instead) … your commentators are the classic duo of Gorilla Monsoon and Bobby “The Brain” Heenan. So watching these old Rumble PPVs, I’m still getting the 80’s vibes. I guess it’s the way WWF/E has always been reluctant to change the way their shows look, and the silly stereotype gimmicks don’t help matters. Flair is out first, and former WWF Champion Bob Backlund comes out to join him (and the crowd goes mild!). Backlund looks good though, he’s fun to watch .. but he’s been out of the game too long for fans to care. At least not yet. Papa Shango is #3, and reminds me of when I liked playing as him on the old Rumble game (don’t ask me why .. I was young and stupid). And just as long as it took me to write that last sentence, Shango is eliminated. And again! Ted DiBiase gets a very early number .. you’d think he would have paid his way to a decent number at this point. I particularly enjoy the pairing of Flair and DiBiase .. could call them The Rich Egomaniacs or something (don’t bite my head off, I didn’t think too long about that name). A way fatter Brian Knobbs than the one I saw a couple of Rumbles ago showed up. Virgil in, and predictably he and DiBiase continued their feud. Knobbs is eliminated when he threw himself at DiBiase, who simply pulled the top rope down. Jerry “The King” Lawler made his Rumble debut next, and got a decent heel reception. Flair seemed intent on destroying Lawler the second he had the chance. Max Moon AKA Paul Diamond out, and man .. the attire is ridiculous. He tried striking Lawler in the corner, but the King threw him out just as the next participant was due. Next up is AJPW star Tenryu, who I must admit .. I didn’t know anything about til I researched him after viewing. Mr. Perfect! The crowd goes wild, as they know he’s coming for Flair. Heenan asked for water .. the intense exchange was too much for him. Skinner next .. yawn. Flair got caught out by Perfect, as he went flying over the top rope! I wish he’d have stayed in longer, as there’s not many big names in yet; but he’s leaving the company so it’s understandable. Koko B. Ware out next, and looking different due to his weight gain and bright green attire held up by suspenders. Skinner got knocked over by Perfect, but held on and pulled himself back over .. only to be eliminated anyways. Samu dragged to the ring by his hair by Afa, and literally thrown in to the action. Backlund is still in there. The Berzerker enters. Perfect eliminates King! Samu & DiBiase throw Perfect over, but hangs on. DiBiase intensely strikes Perfect, and Koko B. Ware joins in as King comes to help for the sake of revenge. Referees hold on to King, which makes it difficult for DiBiase and Koko to eliminate Perfect. DiBiase kicked Perfect in the head, making him lose his grip and fall to the floor; one of the harshest eliminations I’ve seen in any of the Rumbles so far. King and Perfect fight on the floor til they are seperated. Heenan is relieved to see Perfect gone. Odds on favourite out next .. The Undertaker! King almost walks in to The Deadman by accident. Backlund falls to the outside, but under the top rope. Berzerker follows him, and hits Backlund twice with a steel chair (first time a weapon is used in the Rumble?). Undertaker mercilessly dumps Samu backwards over the top rope. Berzerker slams Backlund and leaves him on the outside, as referees tell him to get back in. Undertaker eliminates Tenryu. Terry Taylor in next, minus The Red Rooster gimmick. Koko and Taylor fight, til DiBiase sneaks up and eliminates both. DiBiase turns around and takes the first ever Chokeslam in a Royal Rumble, and eliminated soon after. Backlund remains in the match .. but is still laid out on the outside. WHAT IS THAT! It’s only Giant Gonzales. He made his WWF television debut, despite not being a participant. The Undertaker eliminated Berzerker as Gonzales got in the ring. He looked curiously at the monstrosity standing across the ring. They met face-to-face, but The Deadman had to strain his neck to meet his gaze. They came to blows, and Gonzales eliminated ‘Taker with a chop. He continued to man-handle Undertaker on the outside before throwing him back in. Gonzales laughed as he slammed Undertaker down hard with a chokeslam. Gonzales left Undertaker laying lifeless in the corner, as IRS slowly made his way to the ring. Just to point out .. I enjoyed what happened with Gonzales and Undertaker. It was done really well, and Gonzales’ size, and the way he played to the crowd, should be respected. However, the attire is so laughable it’s difficult to take him seriously as a threat. It’s obvious why Gonzales was a flop, but I don’t think it had much to do with his work rate. What was he exactly? A South American Bigfoot? And he obviously wasn’t as ripped as his costume suggests. To this day, it remains one of the worst attires in the history of wrestling. I always wonder if he could’ve been taken seriously, had the WWF approached his gimmick differently. The Undertaker tried to sit up, but had taken too much punishment. Damien Demento and IRS worked over Backlund after Gonzales was gone. A big pop for Tatanka, as he comes to even the odds. Paul Bearer came down to ringside with the urn, and with the power locked inside, he was able to give The Undertaker the strength to get up and make his way to the back. The other Nasty Boy next, marking the first time both appeared in the same Rumble. The ring began filling up with big guys like Typhoon, Fatu (AKA Rikishi), and Earthquake. Although they were tag team partners, Earthquake and Typhoon immediately targeted each other. They kinda .. bumped in to each other a lot, to little reaction from the crowd. Typhoon charged at Earthquake in the corner, which turned out to be a mistake as he found himself falling over the top to the floor. I don’t get it .. why would they not team up first and eliminate everyone before turning on each other? Either way, it leaves one less big man for Earthquake. Carlos Colon in, and looking a threat right away. He gets Demento out quick, and switches focus to Fatu. Earthquake tries to get rid of Backlund, but the wily veteran keeps finding ways to survive. Tito Santana out! Making him the only man to take part in the first six Royal Rumbles. Backlund gets rid of Fatu with a clothesline. Rick Martel out two minutes later, and wanting to replicate his performance from a couple of years ago. IRS goes out by leaping at Earthquake, and somehow missing the big guy before falling over the top rope. Yokozuna comes out and takes over the ring. The eliminations come quick, as Yoko takes out Tatanka, Colon, and Earthquake (nice stare down though! And Owen Hart slinks in as they fight). Repo Man makes his way in, as Yoko works on Santana. And finally, the other wrestlers smartened up and collectively went after the big man. Didn’t do much good though, as Yoko headbutted and punched his way out. And here comes #30 ..
MACHO MAN! Oh, and there goes Santana thanks to Yoko. Owen gets Saggs out. Owen gets hiptossed hard by Yoko to the outside. Macho Man gets Repo Man out. Backlund and Martel scrap, and Backlund gets Martel sitting on the turnbuckle. One hard strike to the face and Martel is history. Backlund looks around at the crowd and they cheer him on .. and I don’t think anyone thought he’d make it to the final three. Backlund looks like he’s running on fumes as Yokozuna turns his eye to him. Backlund uses his athletic ability to dropkick the big man and keep his distance. He goes for one more on Yoko, but the big guy side steps and throws him over. The crowd certainly cares about him now. And Backlund set the longevity record, beating Flair’s time from the year before. Macho Man and Yokozuna fought for the next five minutes. Ok .. here’s where a potentially good Rumble can turn sour. The ending is probably the worst I’ve seen so far, and it comes down to two things. Firstly, Macho Man hit his Elbow Drop on Yoko, which usually keeps a guy down .. at least for a bit. Whoever booked the match, purposely made Savage go for a pinfall. There’s no pinfalls in a Rumble .. so he’s laid on top of Yoko for no other reason than stupidity. Yoko then launched Macho Man (like he’s James Ellsworth) over the top rope .. while laid on the mat after taking a Macho Elbow Drop. What the hell? How does that work? Anyways .. Yoko won the match, and never looked like losing. Yokozuna joined the list of wrestlers to win the Rumble on their first attempt (others include Jim Duggan, Big John Studd & Ric Flair) . The longevity record was set for the sixth year in a row. Backlund beat Flair’s record with a time of 61 minutes, 10 seconds. Tito Santana was the only man to enter the first six Royal Rumbles. Jake Roberts left the company the previous year, so he was unable to match Santana. Despite being employed by the WWF, it was the first time Hulk Hogan did not appear on the show (in any capacity) since Rumble #2. Five days before the show, Flair lost a Loser Leaves WWF match against Mr. Perfect in a taped episode of Raw; which aired the night after Rumble #6. Flair left for WCW, and we wouldn’t see him in a Rumble again til 2005 (despite returning to WWE in late 2001). The Giant Gonzales was the first man to have a significant impact on a Rumble match, without being named a participant. It’s not the easiest to rate as it’s difficult to beat Flair’s victory from a year ago. However, I did enjoy this Rumble. There were moments I’ll gladly remember, but there were a few issues with the booking. Hulk Hogan always brings an element of impending doom to any Rumble, so it was lacking some star power and buzz. Not only that, but Flair and Undertaker were taken out too soon. There were good reasons, but imagine if Flair and Taker had lasted til Yoko arrived? It would’ve made the final third far more thrilling. There were some complaints from reviewers about the match having too many tag team wrestlers, but I didn’t notice .. as every Rumble (in the series so far) has featured a lot of tag team guys. The ending was poor, and I have no complaints about Yokozuna winning, it’s more to do with the way it was handled. I would’ve liked to have seen Macho Man come really close to getting the big guy out, to give fans hope of a Macho Man vs. Hitman main event. He never looked like a threat though, yeah I guess .. he was surviving and dishing out offense, but we saw 7+ guys trying to get rid of the big sumo earlier .. only to be swatted away like flies. There’s a difference in the quality of talent compared to previous years. There was a lot of movement in the industry at this time, as some were jumping to WWF while others were going the other way to WCW, Japan, and the independents. It’s a Rumble which delivered with who they had available, and while some may claim it was one of the worst of all time, I shall reserve judgement. I’m 90% sure there’s been worse in recent memory. The Royal Rumble sets the stage for Wrestlemania, and we got it with #6. If you want to get really cynical about it .. we could say the match was worthless. And why would we say that? 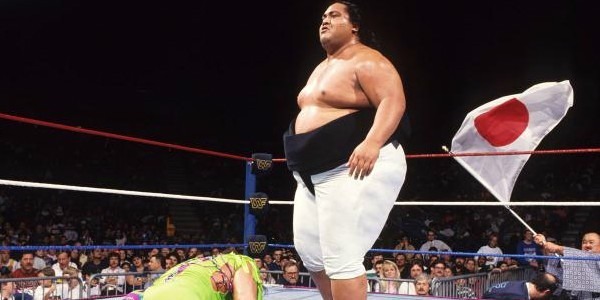 Because yes, Yokozuna went on to beat Bret Hart for the title .. but he only held it for a few minutes before losing it to The Hulkster (who hadn’t worked a match in a year). He got the title back of course, but it showed that it doesn’t matter if you win the Rumble .. because all it takes is for Hulkamania to weasel its way in to taking your spotlight brother! And then it’s going to disappear and work for the other company brother!